Since I am home with a sick boy, I thought I’d take the opportunity for a little Passover follow-up. The Passover story we tell every year is such a rich one but it often gets lost amidst hunger and outdated haggadot. This year our 2nd night seder was tailored specifically to our youngest guests – a group of toddlers from our PEPS group (if you aren’t in Seattle, PEPS stands for Program for Early Parent Support). 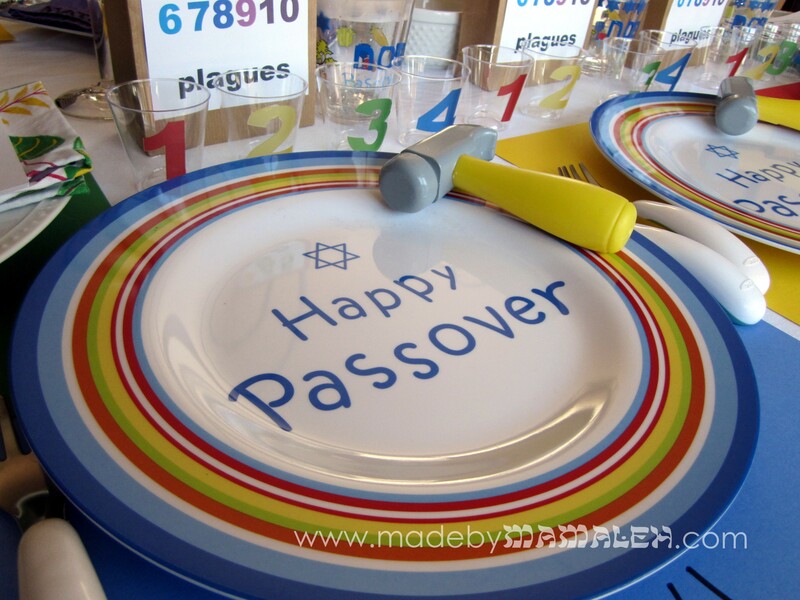 Using the URJ’s seder for toddlers age 2-3 as a template, I copied the content and added my own into an easy to hold program just for the adults using MS Publisher. I even pre-assigned the sections to help expedite things! The content was written for kids and they really did a good job of following along and paying attention. In addition to this, I pre-downloaded this song about the 10 plagues which we played at the appropriate part of the seder and which was a big hit with the kids. 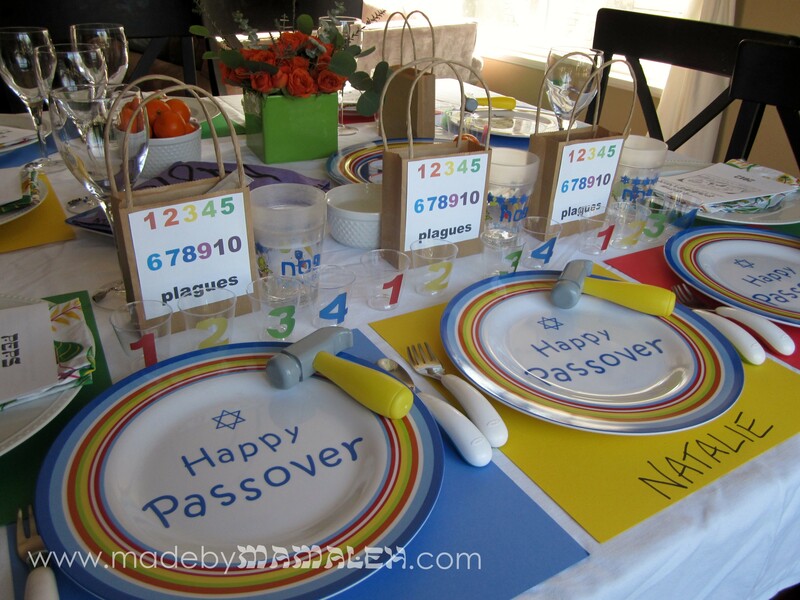 Since a group of toddlers is very into numbers and colors, this was the focus for our seder table. For the 4 cups of wine, I used clear plastic shot glasses (a novel use for these I am sure) and used the print and cut feature on my die-cut machine and clear label paper to create numbered toddler-size cups for each of the four glasses. 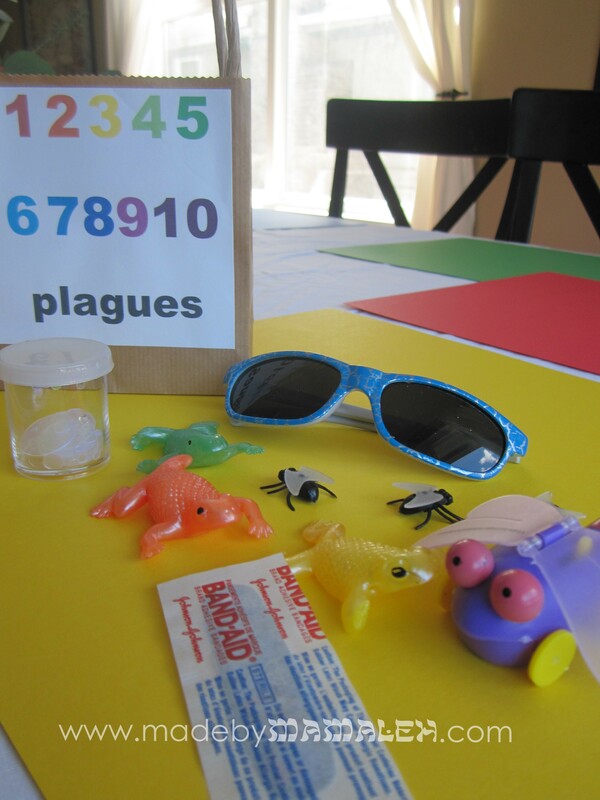 I also created plague bags with a label with the numbers 1-10. 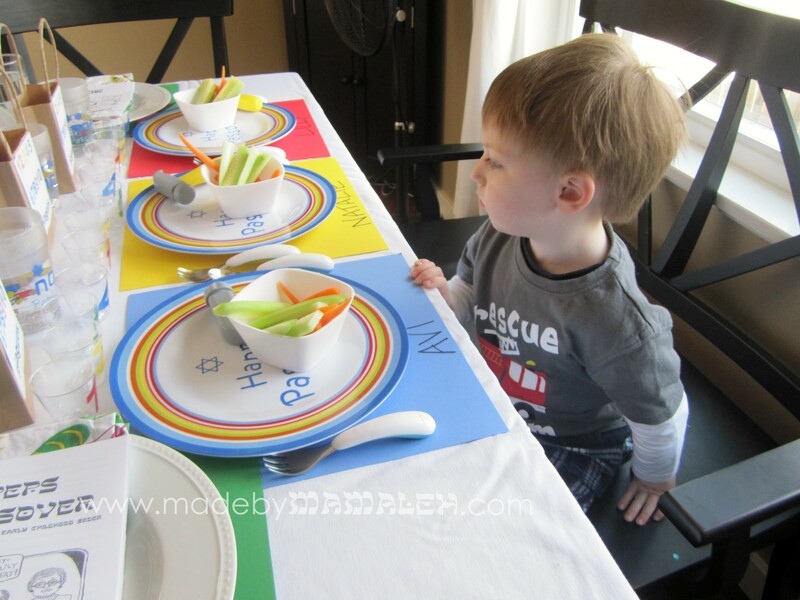 Placemats were made using primary colors of scrapbook paper which made for not only easy cleanup but easy personalization, with each child’s name written across the bottom. The dishes were ones I had picked up at Target a couple years ago on sale – I love them! Each kid got a toy hammer for pretending to hammer along with one of the songs. Such fun! The plague bags themselves were filled with stuff to go along with the song. You’ll note the “blood” confetti above that I made using red cardstock and my die-cut machine and a raindrop image. Even my husband was surprised when we sang about the blood and I suddenly tossed a handful of confetti at the kids. The bags themselves contained a little shaker of confetti (hail), sunglasses (darkness), wind-up flying bug (lice), flies (flies)sticky frogs (frogs) and a band-aid (boils). We didn’t have something for every plague but that was just fine, there was plenty to keep the kids engaged and involved in the seder. Oh and one other tip, little bowls of cucumbers and carrots (karpas) for the kids to dip as necessary before it’s time for the actual meal. Overall, it all turned out really well. My husband said it was the best seder he’s ever been to! I can’t wait to do a new variation next year! Hope you all had a lovely Pesach!